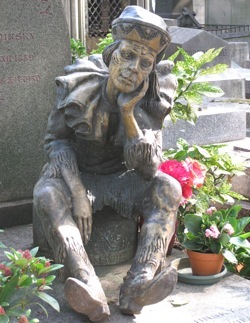 Resting place of many famous artists and writers, Paris's Cimetière Montmartre provides a peaceful respite just minutes from the busy center of Montmartre. 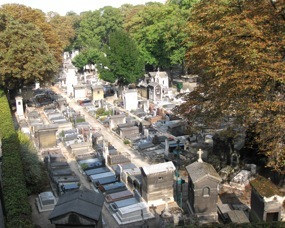 On a recent visit to Paris, we were fortunate enough to rent an apartment overlooking the Montmartre Cemetery. Although we were just a short walk from the busy Place de Clichy, and not far from Sacré-Coeur and the Place du Tertre, the vast cemetery in the western part of Montmartre gave us a sense of being in the country. 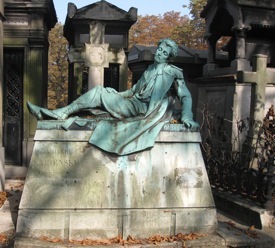 Although Père-Lachaise is the most famous cemetery in Paris, the Cimetière Montmartre (also called the North Cemetery) also holds a significant number of famous people, particularly artists of all kinds. When we visited the cemetery we were reminded of how big it is, as we walked through its many paths and roadways. Despite its size, the Cemetière Montmartre has only one entrance, the Porte Principale, on the tiny Rue Rachel. Be sure to stop at the guard post and get a free map; without it you'll wander aimlessly. The cemetery is laid out in numbered divisions, and the map indicates each famous tomb by a specific number within a division. For instance, artist Edgar Degas is number 1 in Division 4, while Alexandre Dumas is number 1 in Division 21. Hills and steps make following the map challenging at times, but it is worth persevering. 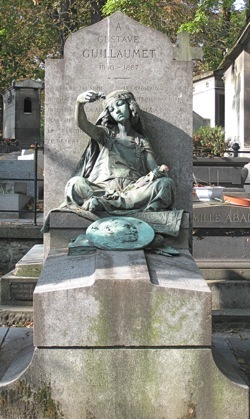 Who are some of the famous people buried in the Montmartre Cemetery? Here's a partial list. There are many other famous people—artists, politicians, business people, and even a couple of executioners and a motorcycle champion—buried here. But there are also plenty of "regular folks" who have chosen this as their final resting place. Some of the unknown tombs and sculptures are among the most beautiful. As you visit, you may see people tending graves, or you may even come upon a burial. Remember that while the Cimetière Montmartre is a beautiful park, it is also a cemetery that is still in use. Visitors are asked to "Be respectful to the dead, their relatives, and other visitors. Please, adopt a decent attitude and keep silent."